Hello Friends & readers of Chandoo.org, I am very happy to announce that my new crash course on Excel formulas is ready for your consideration. Please read this short page to understand the benefits of this program & sign-up. What are the topics of this course? What do you get when you join this course? Example Workbooks & Homework: Each lesson comes with an Example workbook & every week we have some homework to test your skills. You can view the solutions in a different file. Ability to download HD version of the lesson videos: Every week, you can download all the lessons in HD format for later viewing & reference. 1 Year Online Access to the lessons: You can access all the lessons for one year from the date you join. 30 Days Money-back Guarantee: You have no-questions-asked money-back guarantee. If you do not like this course for any reason, just let me know and I will issue your money back. Simple. Once you make the payment, you will receive an email with Module 1 lessons. Then, every week, we will be sending you a new module for 6 weeks from the date you join. Call me at +1 206 792 9480 or +91 814 262 1090 or E-mail me at chandoo.d@gmail.com. I will be able to help you right away. 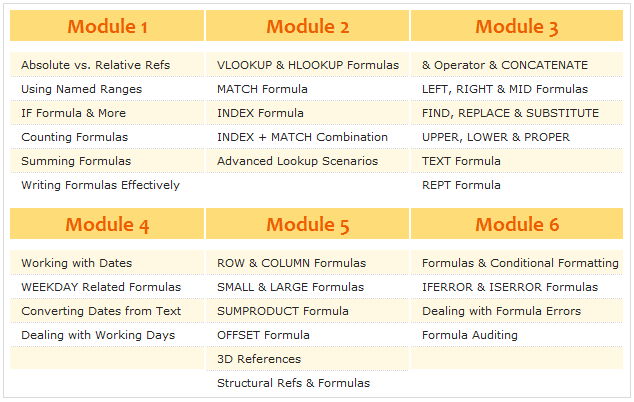 Visit Excel Formula Crash Course Sales Page. So basically am a big fan of your fun interactive excel baby steps. Now I need to apply for an internal job as a reporting specialist & am not using excel at all, I thought about studying the baby steps from beggining to end, then study the excel formula crash course, please give me your advice as you are an expert & master of excel. Will the baby steps be enough to prepare me for the crash course (will the crash course be what I need to be prepared ? ), or what would you recommend, (am a very hard worker).